← Guest Post: ‘The Days I Remember,’ By Larry Mac. The veterans are uniformed in dark suits with black ties; there are no medals. They sit at the back like the bad boys on the bus, chattering slightly too loudly during the minister’s opening gambit. The lads are venerated, and so have to police themselves. After a few final impish moments one holds a finger to his lips, allowing the sermon to swing into full flow. Reverend Billy has been tending his flock well. Known them for years, he has, and he’s done a good job; always out round the parish, looking in on them, delivering kind, sensible words, and harvest-season produce. I’ve met him at the doorstep a few times and chatted. He’s brusque, forthcoming, and kindly. I have no idea what the hymns should sound like, but unlike many services I’ve attended, this congregation knows them and they sing out loud with pride. I mutter the words self-consciously, quietly, out of tune, wondering if this is a generational thing. Billy knows his football. He recognises and acknowledges the ones in the assembly: Linfield’s manager and chaplain; the former team mates; the sons and daughters. Billy’s got stories. Some of them I’ve already heard from Gerry himself, conspiratorially shared in a guldering whisper by the front door of a damp Belfast afternoon. Others I didn’t know, like Gerry’s 100% record for The Blues: played one, scored one, against Man Utd. Or the ‘expenses scandal,’ when he put in a bill for, what, five shillings, and was asked did he come to work via America. Apparently the bus from Donegall Pass to Celtic Park was 2d in old money. 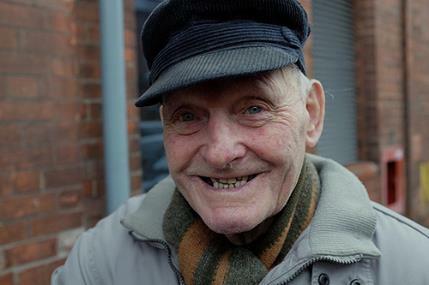 Over tea and a sandwich at the back of the church Jimmy Donnelly tells me he’s now the last one left of Belfast Celtic. Gerry was a nippy wee outside right, never stopped running, had great pace. Ask anyone and they’ll tell you that if Gerry had been playing today he would have been up there in the firmament with the best of them. 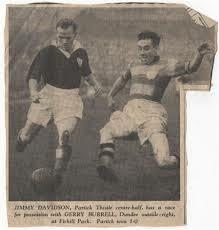 Gerry Burrell (L) playing for Dundee. We’re talking to Gerry’s widow, as strong a woman as you’d ever meet, turned ninety just two months before her husband. She’s tired and with failing eyesight can barely see Jimmy, so he has to introduce himself. He mentions that he’s a catholic and before he can continue she takes the words out of his mouth: she and Gerry were never bothered by any of that stuff, thank God. He accepted everyone, no matter what race or religion. See them assembled here, the old comrades, their sons and daughters. The still air is peopled by their spirit; love, memories, and banter are shared. There was no money in the game back when they were at the top of it: no Twitter revelations, no Maseratis or Mohicans, no aftershave adverts. A heavy leather ball, a few quid, and a steamer voyage to America on tour if you were any good. Truly a different ball game. Gerry Burrell. Picture by Moochin’ Photoman. This entry was posted in Uncategorized and tagged Belfast, Belfast Celtic, Celtic Park, Chesterfield, Donegall Pass, Dundee, Football, funeral, Gerry Burrell, Huddersfield, Jason O'Rourke, Jimmy Donnelly, Linfield, Manchester United, Maserati, Moochin' Photoman, short story, Soccer, St. Mirren, Twitter. Bookmark the permalink. I just stumbled on your site tonight, and am really enjoying your work here. This piece in particular is just superb. You lectured on some of the modules I studied in QUB back in the 90s – always enjoyed your teaching style. Hi Andrew, great to hear from you, and I’m glad you’re enjoying the Vernacularisms. Hope all is going well with you – keep in touch. Jason, really enjoyed reading your story. You have my aunt and uncle off to a tee! Thanks, I’m glad you like it. I’ll miss Gerry.